Library Tree is a JScript media library viewer. Compatible with default user interface (DUI) & columns user interface (CUI). Supports transparency (requires CUI & panel stack splitter or similar). Customisable media library views. Use // to separate name & | to separate branches. Existing views can be edited or new ones added in panel properties. Multi-value tag support. Use %<field>% syntax for fields to be split, e.g. %<genre>%. Accurate filter: text and queries (e.g. artist HAS beatles). 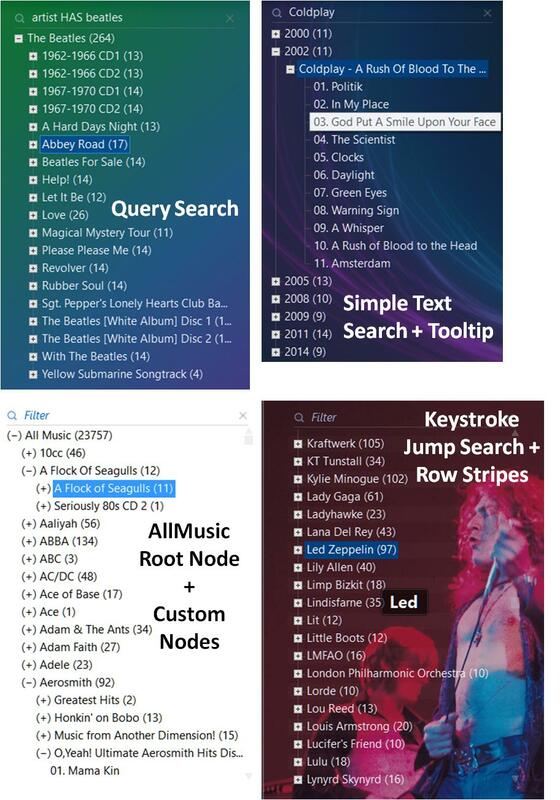 Gives same results as DUI album list filter. Both give sorted results so that query sort operations are N/A. Filter can be hidden. Discrete scrollbar; can be resized / hidden. Mouse wheel: page or standard 3 line scrolling (page = default; change in panel properties). 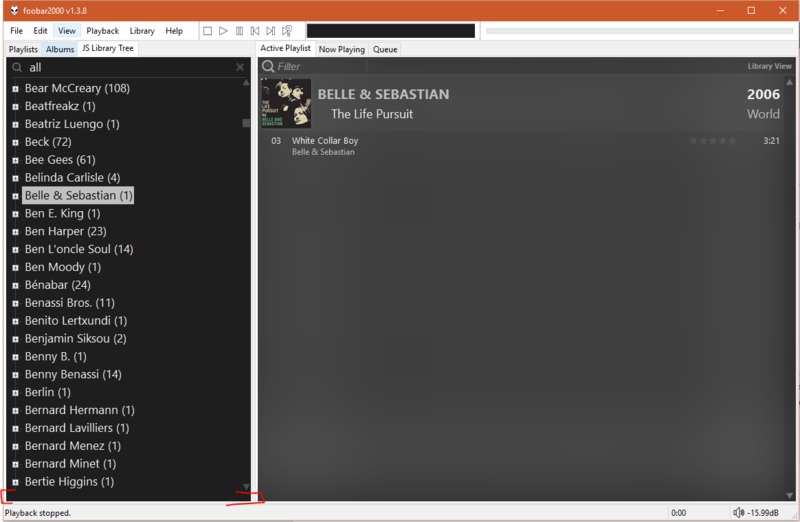 Colours and fonts: set in foobar2000 preferences for DUI or CUI. Font size: set with DUI or CUI list font. Or use mouse-over with CTRL + mouse wheel to zoom the font size (resets if UI font size changed). Extra custom colour options are in panel properties: presets for auto fade & blending of colours used by filter & lines plus ability to set all colours individually. Customisable node symbols: windows themed or font symbol. Arrow key navigation + ctrl & shift selection. Mouse middle button > adds to playlist. 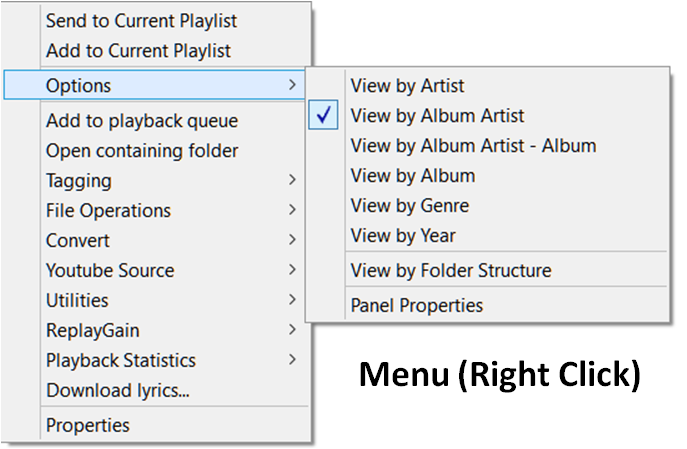 Full context menu on right click. Panel properties has further options, e.g. display settings for "All Music" node, item counts, alternating row stripes, tooltips, auto-collapse, margin, tree indent & autoplay. Access panel properties by right click > options. Installation: Add a JScript Panel to the layout in the usual way. Click the JScript panel (or right click and choose configure) to open the editor. Use the tools button to import the Library Tree script. just one little thing but maybe it's me : mousewheel UP + CTRL zoom out, it should do the opposite no ? Nice git for the new year !!! Thanks for this, I've given it a test and I like it. I'll integrate it into my layout. tks for sharing! very fast! if use Multi-value tag ,it will be like this. @asionwu: Thanks for reporting the multi-value splitting issue. Multi-value tag handling is now done differently and the issue should be fixed. @falstaff: Corrected zoom mouse wheel direction. Thanks for reporting. Fixed a few other bugs + added some enhancements. I am familiar with the thanhdat script and have posted about it on HA. This resulted in emails from other users, who became frustrated as it became increasingly broken, due to incompatibility with new versions of wsh / JScript panel, and other issues with the script. So I was asked if I had done a modified version. In a nutshell, I found better ways of doing it. The result is a distinctive script and new code. The library handling / processing etc are done differently resulting in JScript Library Tree typically being 3-4 times faster. JScript Library tree also automatically syncs with the media library. Additionally, JScript Library Tree has lots of stuff / handling absent from the thanhdat script. The ideas and contribution of thanhdat in showing how it was possible to code a library view in wsh panel, and of others, is credited in the acknowledgments in the readme. I've given it a test and I like it. I'll integrate it into my layout. the "population" before applying that view? In the view settings, it seems to divide the string with "|" before it is calculated. It is good for avoiding bugs when the metadata contains the | character, indeed, but it also means that the depth of the tree cannot be variable. As some of my tracks do not have an content group or edition, it may cut the depth of the tree when needed. I think maybe your script can be enhanced this way. Thanks for bringing us this awesome script, again. Thanks for the update !! And I think it's better to to create the thread in other some other part of the forum rather than "Uploads"
This forum is for uploading files only - everyone can attach files to their posts. Discussion should be kept separate and in another forum. Note that recent posts in this forum are not shown in the foobar2000 forum portal - this is on purpose. thanks for the update WilB. @Scrummble - I did look at this in some detail. For me, varying the number of branches from one node to the next according to whether tag info happens to be present or not is rather confusing. I also think there are other ways of doing it, e.g. consistent tagging or conditionally displaying variable info at the end of branches. For these reasons and because the changed jscript library handling needed will slow things down, I am reluctant to add it. @fals33 - I have added an option in properties to switch "Auto Fit" off. - Added a filter that applies before the tree is populated, enabling the tree to comprise different sub-populations of the library. Filters also offer quick access to commonly used queries. The filter can be hidden & has its own zoom. - Set filters in properties. Use text or foobar2000 query syntax. Gives sorted results and so sort operations N/A. - Fixed multi-value tag handling for fields that foobar2000 automatically remaps. - Search box renamed to "Search". - Made auto fit optional [set in properties] (auto fit stops clipping of text in the bottom row). - Added ability to set colour of custom nodes in properties. - Search symbol now opens query syntax help. - Fixed speed regression in rare case. - Improved handling of views and filters in panel properties. - Fixed minor redraw issues. - Made compatible with JScript Panel 1.1.0+. Due to user requests, a separate discussion thread has been started, and future discussion should go here.. The new thread contains updated pictures incorporating the filter and an updated feature summary. Ooooooh! Just found this day before April Fools Great alternative. Got one small idea for a future release though. Just cosmetics but it makes for a more consistent feel IMO. As example, suppose you have a 15track album with a cue sheet (for whatever reason, e.g. to separate hidden tracks from the main song) resulting in effective 18 tracks, possibly having an m-TAG file pointing to the cue file for tag information, that will end up being counted as 15+18*2 = 51 tracks....apart from this, you lose the information of how many items there are on a particular sub level. ^ Regarding item counts, I prefer these to sub-item counts + it's difficult to change. I also use m-TAGS. But overall, I think both ways have there advantages and disadvantages. WiLB, this component is awesome! Thank you for sharing! 2 Add to Current Playlist - add always just in "Library view"